The Beer Belly was developed by a couple of ordinary working guys who were chasing the dream to work for themselves. They had some experience in product development and design, and they saw a chance for a new beginning at this idea. Everything started as a joke on a beer evening. Several friends were having some beers and chatting about how they used to sneak beverage into different places… Then came the moment after which the beers became too many, and the next thing that happened is that they found themselves cutting a $300 surfing suit, stuffing a CamelBak bladder in the front and cracking up. That was the moment at which The Beerbelly came into existence. By this moment, the business idea was just a funny ending to the evening, but somehow some people heard about this story and wanted to buy a beer belly. Like one beer leads to another, the same happened with the business. They luckily met a clothing designer who helped them with the best fit. This was how they started selling the bellies. Suddenly Brook Lambert found himself talking about the beer belly business idea on the CNN which gave an enviable boost to their popularity and sales. 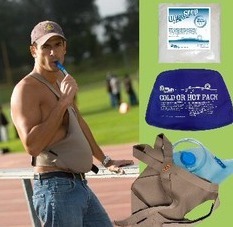 The BeerBelly has a price tag of 35 bucks, everyone who likes it can get it from their site. Another similar idea of theirs is the WineRack, which is designed as a bra, and it’s made especially for women. This way, not only can they enjoy their favorite beverage everywhere, but also make their bosom look larger ;).